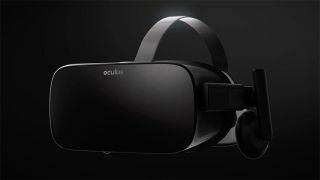 Online retailers are going discount crazy on the Oculus Rift virtual reality headset today. Currys / PC World have knocked £50 off the price, and John Lewis and Amazon then quickly followed suit. Of the three, you're better off going with John Lewis' price of £499 plus a two year guarantee. This is the best price we've seen since launch, and right now it doesn't seem like there's any time limit on the deal. If you want to know what we think of the Oculus Rift, you can check out our review. It has the most comfortable headset available right now, and the tech is good, but the software is only scratching the surface of what's possible so far. A negative is that the Oculus Touch controllers don't come bundled with the main package, so you're going to have to fork over extra cash for that extra immersion. They'll cost you an extra £189 at most outlets, which bags you two controllers and an extra sensor to make it all possible. We're still praising the HTC Vive for being the most complete VR package, but with the introduction of Touch, Oculus threatens to close the gap.